With nearly 400 stores across five countries, we're a one-stop source for domestic, international, and freight shipping services. When you visit your local Pak Mail in Sarasota, we'll find the most cost-effective, safe way to pack and ship your items, whether it's by air, ocean, or ground. Shipped a large antique tv/phono/radio unit to Iowa. Pak Mail took care of it all. No problems. Unit arrived in a timely manner and in good condition. Would use Pak Mail again. The service in a word was "perfect". Welcome to Pak Mail Sarasota! Located in Centergate Plaza on the corner of Bee Ridge and Cattlemen. 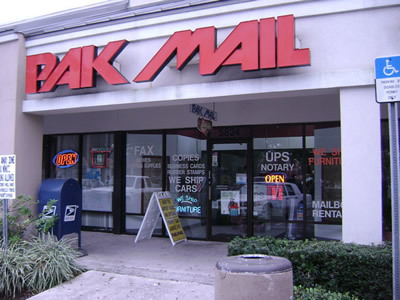 Pak Mail Sarasota is the areas premier packing, crating and shipping store. Unlike other packing and shipping stores, Pak Mail offers you a choice between UPS, FedEx and USPS, as well as freight shippping services. We offer free shipping estimates and free pick-up for large items. We provide estate packing and shipping services and promise to handle all of your antiques and artwork with the specialized care they deserve. As the oldest one owner Pak Mail store in Sarasota County, we have the experience to handle all of your packing and shipping needs.